Natural herbal diuretics had been used for generations to expel extra water from the body naturally lowering blood pressure, reducing swelling and inflammation. Read on to learn more about the best natural diuretics. 1. Dandelion is not just a pesky weed anymore but one of the most powerful all-purpose natural diuretics. 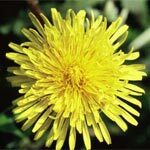 Dandelion promotes water and sodium excretion from the kidneys while supplementing the body with extra potassium that is most often lost during an herbal diuretic therapy. 2. Another priceless member of the natural diuretics family is green tea prized for generations for its healing properties. Green tea offers a variety of health benefits on top of being the best natural diuretic, like high antioxidant content, regulation of digestive processes, wound healing and mood stimulant. 3. Linden flowers are often used in the alternative Western medicine to relieve high fever by promoting sweating. Sweating process is one of the best natural diuretics drawing extra water through the skin pores providing temperature control and inflammation relief. 4. Stinging nettle possesses strong properties of natural diuretics and had also been used in medieval Europe to relieve pains in joints, eczema, dry skin, dandruff, allergies and urinary tract maladies. 5. Parsley will not only add zest to your favorite recipes, it will also help regulate the water to sodium balance in your body. Parsley can be chopped fresh in salads or juiced along with your vegetable or fruit of choice. You can also steep a handful of parsley and drink this tea throughout the day for a powerful kidney flush. 6. Gotu Kola is considered one of the mildest natural diuretics and used for other numerous medicinal purposes, especially in the oriental countries. 7. Hawthorn berries belong to the rose family and are considered one of the most effective natural diuretics known to humanity. The most common way to use hawthorn berries is in the tea form, but watch out for allergic reactions as some people are highly sensitive to it. 8. Not only corn silk is an effective herbal diuretic but it is also affordable and always within reach. Corn silk can successfully treat urinary tract and bladder infections. 9. Juniper berry is a good herbal diuretic, however, do not use it if you are pregnant or have kidney stones. 10. Uva Ursi herb has tremendous diuretic properties, can relieve kidney stones and stop diarrhea. Do not take Uva Ursi for more than a week to avoid potential side effects. As with any herbal remedies, exercise caution when using natural diuretics, and consult a doctor or an experienced naturopath when in doubt.